SAP Marketing Cloud (formerly SAP Hybris Marketing Cloud) offers a comprehensive set of marketing apps that you can use to create leads, and activities in sales. Lead Campaigns: Create leads in Sales: SAP Sales Cloud or SAP CRM. Call Qualification: Create leads in SAP Sales Cloud via marketing campaigns with action for Call Qualification. Marketing-Driven Sales Enablement: Create activities in SAP Sales Cloud or SAP CRM and get an insight on marketing campaigns in SAP Sales Cloud. But how can you nurture your valuable leads through the different phases of your sales cycle? Recently, SAP added a new app Lead Nurture Stream to its portfolio to define the lead nurture stream at various phases of the sales cycle and to support the lead management process as a whole. As from now on Lead Management in SAP Marketing Cloud is called Lead Management and Nurtering. With this new functionality you can define different stages within your lead nurturing process, which represent lead phases of your prospects and customers to engage them during the various phases of the sales cycle to generate leads and to coordinate a longer, broader and consistent cross-channel nurture experience. 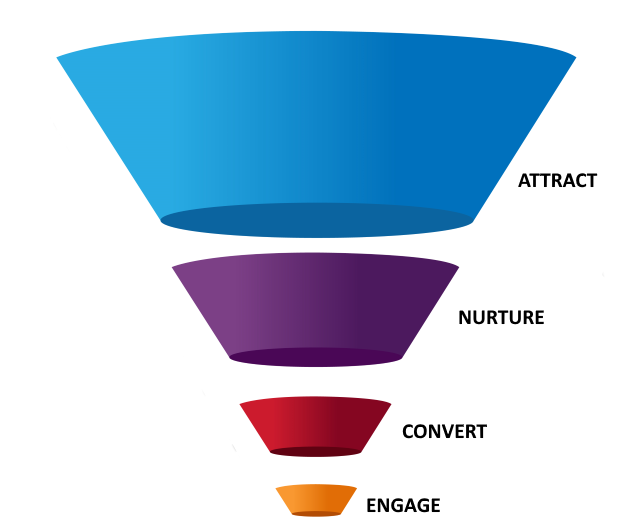 Via the Lead Nurture Stream you can target the right people dynamically across the right stages. The Lead Nurture Streams have programmatic and sequential logic that arranges that individuals flow through the stages and the activities in a structured manner. This functionality is used often in B2B marketing scenarios. With the use of the streams, customers can jump ahead based on their activities, track the success and flow of their prospects and customers and deliver good, qualified leads to Sales. This will make collaboration between Marketing and Sales simpler and easier which will lead to better results. For example you can define different campaigns within the stages to attracts prospects to eventually engage them as qualified leads or customers. This process which will go from the top of the Lead Funnel to the bottom. This can be a website visit in which product info was downloaded, which will trigger a campaign that will send an invite for a webinar. This can be a detailed whitepaper download, which will trigger a campaign that will send an invite for the free trial version of the product. This can be a personal invitation for a demonstration on-site, which will be followed-up with an email for contact and ask for feedback afterwards. 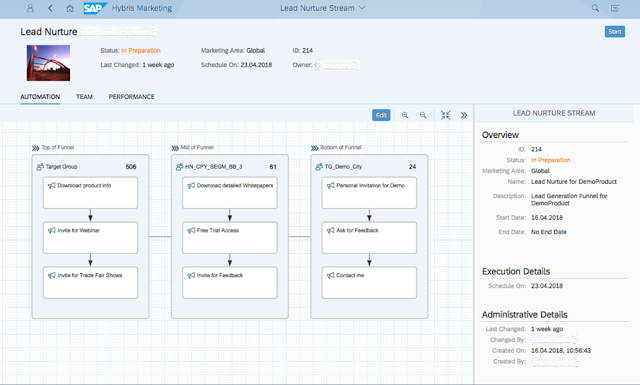 In underneath screenshot an example is shown of how a typical Lead Nurture Stream looks like in SAP Marketing Cloud. It is divided in three phases as described above and within each phase several marketing campaigns are created to support the conversion of prospects to qualified leads/customers. 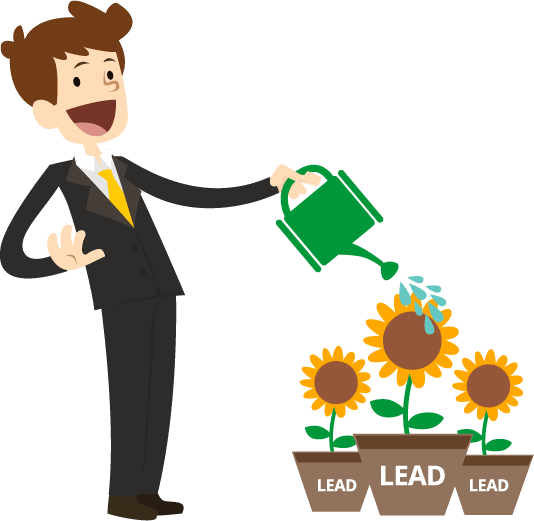 The results of each phase of the Lead Nurtering process can be measured via the Performance tab to adjust future Lead Nurture Streams for better results. Curious how Acorel can help to improve your Lead Nurtering process?